These backlit panel lights use Even-Glow® technology and a diffused optical lens to deliver a smooth, flawless wall of illumination without visible bulbs or hot spots. This on-demand printing allows us to create custom solutions for your company or personal projects using your own photos. Your image is printed directly on the panel lens to ensure that it's smooth and even. The panel lights are perfect for trade shows, exhibits, offices, event companies, homes, and more! Printings range from company names and logos, advertisements, and product images to custom artwork and family photos. See the How It's Made section below for more details. I want to put my panel in a drop ceiling. Do I need to make any major modifications? These panels are designed to replace traditional fluorescent light fixtures, and can be installed in all the same applications with no major modifications are needed. We always suggest that a certified electrician install your light fixtures. I want to put my panel on the wall. Do I need to make modifications to my wall or storefront? Our dimmable printed LED panels have a mounting option for quick and easy, flush mount installation. Non-dimmable models have a driver mounted on the back, so further wall modification may be required. The size and shape of this driver will vary by panel. Please check the specifications tab of the panel(s) you select, where you will find exact dimensional drawings and where the driver is located. Are custom-dimension printed panels available? Yes! We are happy to create an array of panels to meet your design needs. Our image uploader allows you to crop your images. Simply place an order for each individual panel cropped specifically how you would like it to look. Can my custom image be split across many different panels? So for the image to the left, you would place 4 orders with each cropped to match your ceiling. If you need help or have questions, we are happy to work with you to put this together. Please refer to the technical details below for better image printing quality. So for the image to the above, you would place 4 orders with each cropped to match your ceiling. If you need help or have questions, we are happy to work with you to put this together. Please refer to the technical details below for better image printing quality. 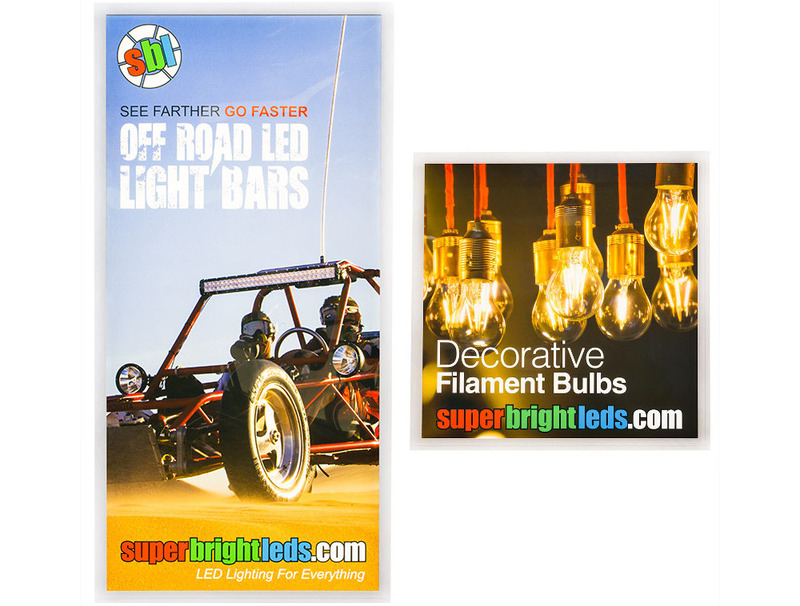 What files work best for printing on Even-Glow® panels? The higher the resolution the better! Lower-quality images may appear blurry when printed. File formats that print well are: .jpg, .pdf, and .tiff. Technical Details: We generally suggest a minimal image resolution of at least 1,500px per foot. So for a 2ft by 4ft panel you would want an image with 3,000px by 6,000px to ensure a high-quality print. What cleaning supplies can I use on my custom printed panels? These can be cleaned with your standard, light duty window cleaners or other similar products. No specialty cleaning products are needed. Abrasive scrubbers and strong cleaning products should not be used on your printed panel. Can I install my custom printed panel outside? Are they waterproof? These panels are designed to be used inside. If installing these in a window, will the sunlight make them fade over time? Our printer uses UV-resistant ink, which prolongs the clarity of the image. However if exposed to direct sunlight for extended periods every day for multiple years, the image will fade. Most clients who have large windows with extensive periods of direct sunlight will mitigate this with a simple UV treatment on their windows—a treatment that is common in many retail settings. For more details about our printing methods, please see our How It's Made. Our Even-Glow® LED Light Box Panels are based on our dimmable LPD panels and non-dimmable LPW2 panels. Each line has slightly different mounting options, however both options are great for drop ceilings. Our dimmable LPD panels have a surface mounting kit option which is ideal for wall mounting business signs or decorative print LED panels as well as mounting to drywall ceilings. The non-dimmable LPW2 series is brighter overall, ideal for drop ceilings, and maybe mounted to a wall but only after modifications have been made to the wall. Stand Alone with Plug: This provides a standard power cord for use when placing the panel in a display that already has a power outlet or when you are not permanently mounting the panel. These panels are mounted using either the built in hooks or with the addition of the Panel Light Suspension Kit. Wall mounting this panel requires holes to be cut in the wall for both the junction box as well as the small slits for the hooks.